Notice: This page is not subject to any update. For updated information please refer to the German pages of this website or the publications by the author. Made for modellers this book mainly consisting of photos is dedicated to first generation MiG-21 single and twin-seaters and Chinese copies. Beside many well-known pictures some interesting new pictures from Eastern Europe can be found in this publication. More than 200 pages of colour photos of late Czech MiG-21MF, MFN and UM show almost every detail of these versions including armament and cockpit equipment. Many details of a Hungarian MiG-21MF are shown on high-quality colour photos - a must for the modeller. With lots of photos like Lock On publication, colour schemes and decals a rich source for the ambitioned modeller. Instructions for the improvement of model kits with many detailed drawings. Polish publication on the MiG-21bis. Especially dedicated to modellers. 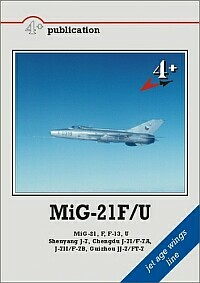 Small publication with extensive information about the MiG-21bis mainly in Polish service.